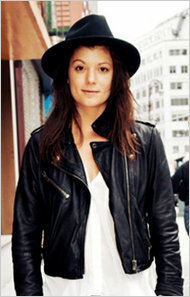 Culture Hopping in a Fedora | Hipsters and Hassids: The painting series. The phenomenon. 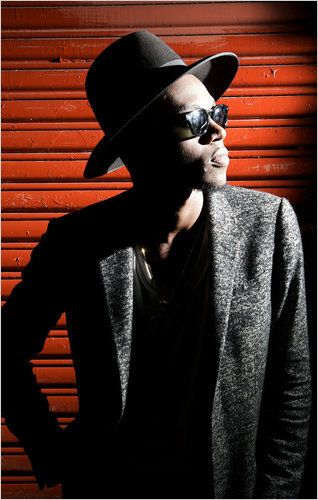 Theophilus London, a hip-hop artist. Called either a “black hat” or Borsalino, for the style’s most famous and expensive brand, the simple hat is most commonly associated with ultra-Orthodox non-Hasidic Jews, as well as members of the Chabad-Lubavitch sect, the Hasidic group based in Crown Heights. But in recent months, the quasi-religious hat has not only popped up on the other side of Williamsburg, where skinny jeans and canvas sneakers still rule, but also in Cole Haan advertisements as a secular fashion accessory. Mr. London didn’t seek his out, either. He was in Williamsburg recording a cover of the Nat King Cole song “Calypso Blues” when he stumbled across Bencraft Hatters, an old-school hattery on Broadway that offers more than 100 styles of felt hats by Borsalino, Stetson, Puertofino and Luigi Baroni. He bought a Puertofino for $120. “I liked the shape of it,” Mr. London said. Since then, it’s become a part of his urban uniform. He wears it to pick up dinner at his local roti shop, to parties at the Top of the Standard, and even onstage. Contemporary fashion has long drawn on religion for inspiration. “There are so many examples,” said Kenneth Ramaekers, director of Modemuseum Hasselt, a fashion museum in Hasselt, Belgium. Mr. Ramaekers cited Jeanne Lanvin’s and Balenciaga’s adaptation of the cassock in the 1920s and 1960s respectively; Jean Paul Gaultier’s 1993 women’s-wear collection, with its strong Hasidic inspiration; and Walter Van Beirendonck’s burqa look for men in 2008. Last February, Thom Browne sent models down the runway dressed as nuns; their habits were removed to reveal the designer’s playful suits and colorful patterns. “Designers have always loved the traditions of religious as well as military uniforms,” said Madeline Weeks, fashion director at GQ magazine. The trend is by no means limited to men. Leandra Medine, the author of the style blog The Man Repeller, who was raised as an Orthodox Jew, gave a tongue-in-cheek nod to women wearing the “temple topper” trend last November. “Some ladies find themselves taking these masculine cues to new heights, Crown Heights, if you will,” she wrote. Leaf Greener of Elle China.